One thing I really love about living in China is the abundance of fresh produce. Every single night there is a truck parked right at the gate of our apartment complex filled with fresh fruit. It’s never unusual to see a person on the street with giant baskets full of cherries or lychee for sale. There are also neighborhood centers every few miles with wet markets, also filled with fresh produce (and some meat that seems a little more questionable, but that’s a subject for a different day). A few weekends ago, Jesse and I were shopping the local wet market for some vegetables I needed for dinner. As we passed the fruit stand we decided to grab a some blueberries and a few kiwis. It’s not unusual for the stand owners to insist we taste test several other fruits. They probably know that I’m an easy sale. So, we weren’t surprised when the lady behind the counter peeled a lychee for us to try. I’m not a huge fan of lychee, but I took a bite, smiled, shook my head and said “Bu yao” (equivalent to no thanks). So she moved on to the next fruit, a small handful of really gorgeous Rainier cherries. Those, we could not say no to. As we were leaving (blueberries, kiwi, bananas, and cherries in tow) Jesse looked at me and said, “You think you could make a cherry pie, maybe with blueberries too?” Challenge accepted. Which is some what comical because, as far as I know, I don’t like pie. Too much mushy fruit. But, not being one to back down from a challenge, I went to a reliable source to find a recipe, Martha. Later that afternoon I was sitting at the table pitting cherries, hoping that I might, just might, like the pie that I make. And much to my surprise, I did! Preheat oven to 400 degrees, with rack in lowest position. Roll half of the pie dough out onto a sheet of parchment paper, into a 14-inch round. 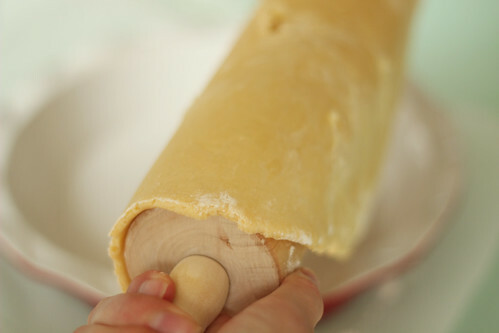 Carefully wrap the pie dough around a rolling pin and transfer to a pie pan, gently press the down, without stretching, so it is touching the entire pan and not just hanging from the sides. There should be about 1 inch of hangover on the outside of the pan, trim any excess. Roll the other half of the pie dough into another 14-inch round. Using a pizza cutter, cut into 10 even strips. Set aside. In a large bowl, stir together sugar, cornstarch, and lemon juice. Add the cherries and blueberries, stirring to evenly coat. Pour the filling into the pie pan. Lay 5 of the pie dough strips, evenly spaced, horizontally across the pie pan. Fold back the 2nd and 4th strip, just past the center of the pie. 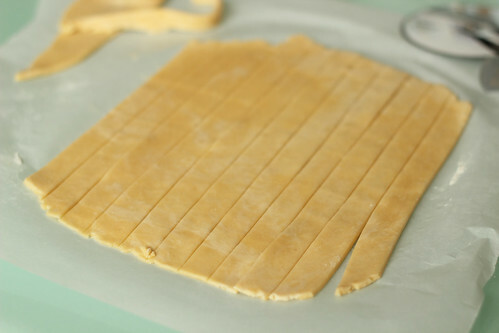 Lay 1 strip of dough vertically (perpendicular to the other strips), just to the open side of the folded back strips. Unfold the strips, so now there should be 5 strips lying horizontally and 1 strip lying vertically (centered in the pan). Now you will work from the center out. To the right side of the single vertical strip, pull back the 1st, 3rd, and 5th vertical strip. Place a second strip to the open side of the fold. Unfold the strips (now there are 5 horizontal strips, and 2 vertical strips). To the right of 2nd vertical strip, pull back the 2nd and 4th horizontal strip. Place a third strip to the open side of fold. Unfold the strips. Repeat the same 2 steps on the left side. You should now have a lattice top. 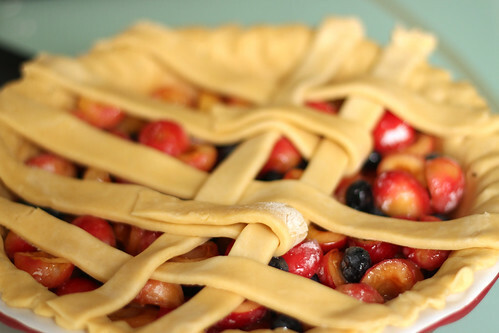 Trim any strips that stick out further than 1-inch from the pie pan. Tuck and press the strip edges into the outer crust. Crimp edges as desired. With a pastry brush, brush the lattice top with egg wash and sprinkle with sugar. 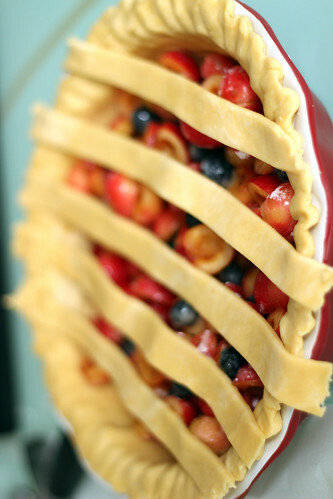 Place pie on a rimmed baking sheet (to prevent spillage!). Bake at 400 degrees until the filling is bubbling all over, about 60-70 minutes. Tent the outer crust with aluminum foil as needed, to prevent burning (about 40 minutes). Allow to cool to room temperature on a wire rack before slicing to serve. In a food processor, combine flour, salt, and sugar; pulse briefly. Add butter; pulse until mixture resembles coarse meal, with a few pea-size pieces of butter remaining. Sprinkle with 1/4 cup ice water. Pulse until dough is crumbly but holds together when squeezed (if necessary, add up to 1/4 cup water, 1 tablespoon at a time). Do not overmix. Divide dough in half, and turn out onto two large pieces of plastic wrap. Fold plastic over each portion of dough; press to shape into two 3/4-inch-thick disks. Refrigerate until firm, at least 1 hour (and up to 3 days); dough can also be frozen up to 3 months (thaw before using). Looks gorgeous lady! Wish I could share a piece with you. Love the fresh produce too, and Rainier cherries are my fav. Yeah for making a pie that you can enjoy! I'm not a fan of lychee either, it has a weird texture that I can't get over. This sounds right up my alley, and I hope that we have those cherries at my local farmers market. 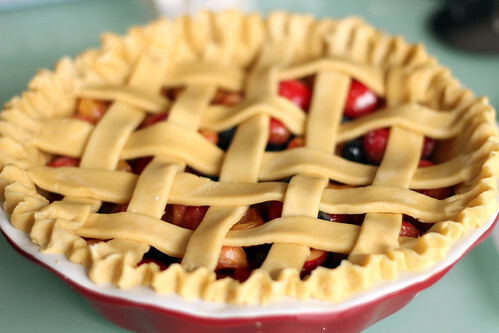 Your lattice is PERFECT! Beeeeautiful! 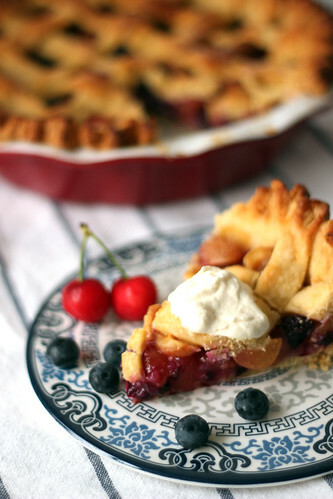 Who doesn't lover cherries and pie? 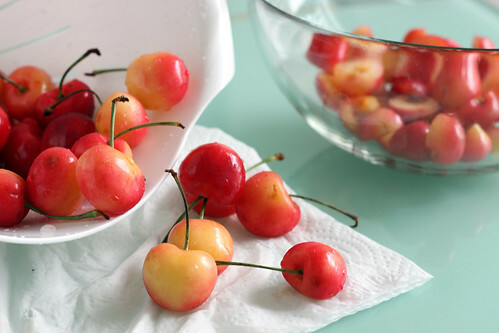 What a great way to use up some really fantastic looking cherries!